Among the most highly regarded texts in physical geography, Robert Christopherson’s best-selling Geosystems: An Introduction to Physical Geography is known for its meticulous attention to detail, up-to-date accuracy, and rich integration of climate change science. Uniquely organized, the text presents Earth systems topics as they naturally occur: atmosphere, hydrosphere, lithosphere, and biosphere. This interconnected and organic systems-based approach is highlighted in strong pedagogical tools, a structured learning path, and current, updated information. The 10th Edition includes new features and activities that help readers apply geography to the real world, revised infographics, and new exercises designed to enhance learning. Mastering™ Geography is an online homework, tutorial, and assessment product proven to improve results by helping students quickly master concepts. Students benefit from self-paced coaching activities that feature personalized wrong-answer feedback and hints that emulate the office-hour experience and help keep students on track. With a wide range of interactive, engaging, and assignable activities, students are encouraged to actively learn and retain challenging physical geography concepts. Note: You are purchasing a standalone product; Mastering Geography does not come packaged with this content. Students, if interested in purchasing this title with Mastering Geography, ask your instructor for the correct package ISBN and Course ID. Instructors, contact your Pearson representative for more information. 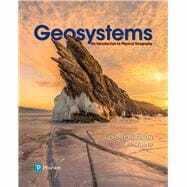 Geosystems: An Introduction to Physical Geography, 10 th Edition is also available via Pearson eText, a simple-to-use, mobile, personalized reading experience that lets instructors connect with and motivate students — right in their eTextbook. Learn more. Robert W. Christopherson attended California State University-Chico for his undergraduate work and received his Masters in Geography from Miami University-Oxford, Ohio. Geosystems evolved out of his teaching notes and was his graduate thesis: this is his life’s work. He founded the geography program of American River College faculty. His wife Bobbé is his principal photographer and has provided more than 300 exclusive photos for each of his books. Together they have completed nine polar expeditions (most recently in spring 2010). They attended the 2004 Arctic Climate Impact Symposium in Reykjavik, Iceland to acquire photo and video coverage and research. Robert is the recipient of numerous awards, including the 1998 and 2005 Text and Academic Authors Association Textbook Award for Geosystems and Elemental Geosystems, 4th Edition, respectively. He was selected by American River College students as "Teacher of the Year" and received the American River College Patrons Award. Robert received the 1999 Distinguished Teaching Achievement Award from the National Council for Geographic Education and the Outstanding Educator Award from the California Geographical Society in 1997. The Text and Academic Authors Association presented him with its Presidents' Award in 2005. Amongst many other things, Robert has been deeply involved in the development of Pearson’s Geoscience Animation Library, and he led the editorial board of Rand McNally’s Goode’s World Atlas, 22nd Edition. Ginger Birkeland received her MA and PhD from Arizona State University, with a focus in fluvial geomorphology. She taught intro courses at Montana State University and Indiana University, spent time as a research associate at Arizona State, and has spent many years as an outdoor education instructor and commercial river guide. Ginger has worked in the field as a fluvial geomorphologist for industry and funded government projects. Some of her field projects include: a multidisciplinary plan for recovery of two threatened fish species in the Truckee River Recovery Plan (California and Nevada) for the US Fish and Wildlife Service; geomorphic oversight, technical expertise, and technical editing for the Menomonee River Sediment Study (Wisconsin); geomorphic expertise, and co-authoring of several sections on fluvial geomorphology for reports on bank protection and salmon habitat enhancement for the Integrated Streambank Protection Guidelines and Channel Design Guidelines (Washington).